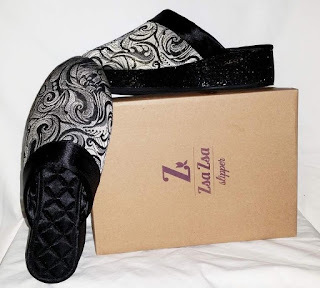 This is a sponsored conversation written by me on behalf of Zsa Zsa Slippers. The opinions and text are all my own. Admit it....Every girl dreams of growing up to be a princess. While things change and the real world comes knocking we can still dress the part of the princess. Pampering yourself with great shoes from Zsa Zsa Slipper is a great way to do that. 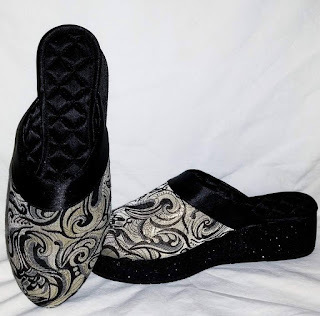 Zsa Zsa Slipper are fancy pillows for your feet. Yes, they are slippers but I wear them outside the house too. They are very well made and form fit to your little piggies with wear. They offer both comfort and support so your feet and legs feel energized. I felt very comfortable walking in these and I'm not a heel wearing girl. They feel very stable when walking, I didn't feel wobbly at all while wearing them. I ordered the size 10 because I was told they run same. I normally wear a 9 and the 10 fit me perfectly. They are also made more for a narrow foot than a wide one. They look cute with a pair of slacks and dressed down with blue jeans. Zsa Zsa Slipper are available for purchase on their website for $99.99 with free shipping. Jeanne Johnson-Bennett also generously agreed to do a giveaway for one of our readers!